Restaurant review: Cali-inspired casual eats at Foodwell in Salford. 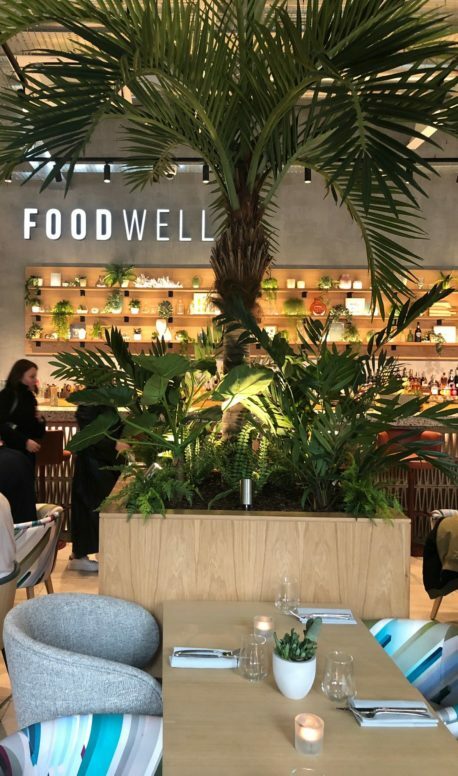 Foodwell is a new, LA-inspired eatery with a glass-fronted yoga studio and peachy colour scheme. However, there’s much to be said when it comes to being open minded, and that’s particularly true of this Salford newcomer. The light-filled space, just over the River Irwell’s pedestrian suspension bridge from Spinningfields, is so beautiful and so full of plants that its hard to imagine anyone not loving it. Open from 7am (ish) until 11pm, the Cali-chic menu takes in caramel miso granola bowls, lobster nachos, sun-kissed juices, hunky wraps, ricotta hot cakes and creamy, raw chocolate and peppermint brownies. There are carb-free Aussie breakfasts (£7) and vegan soul foods – and, over two visits, everything is excellent. Matthew Nutter is the venue’s award-winning head chef, and his special ‘Plannt’ vegan menu, which complements the other more meaty and veggie menus, is a real draw. Charred cauliflower shawarma (£12) with coconut yoghurt, pine nuts, pomegranate and rose petals and sticky celeriac steak (also £12) perched on carrot and butternut squash noodles with Korean hot sauce are both superb. Cornbread, grilled to order, arrives bursting with jalapenos and sweet corn pieces (£9) and the superfood burgers, salmon and passionfruit cerviche and steak with jerusalem artichoke wedges look great too. It’s good to see Matthew Nutter cooking again too. He was crowned Chef of the Year at the Manchester Food and Drink Awards in 2017 for his vegan fine dining restaurant Allotment in Stockport and the move to a more casual restaurant done nothing to dilute his talent in the kitchen. For more food and drink in Manchester, click here.